Why does it flood more just north of Leclaire? I have a theory. If one looks at the maps of the river in the 1930’s, which is before lock and dam 14 was constructed in 1940, you can see there are islands north of Leclaire on the Iowa side. These were all flooded when the pool was raised. But now they lie just below the surface of the river, and certainly take up displacement that would otherwise be taken by the river water; it has to go somewhere so it goes even higher and floods. You can try this link to the Iowa State server which has historical aerial pictures, pretty neat. 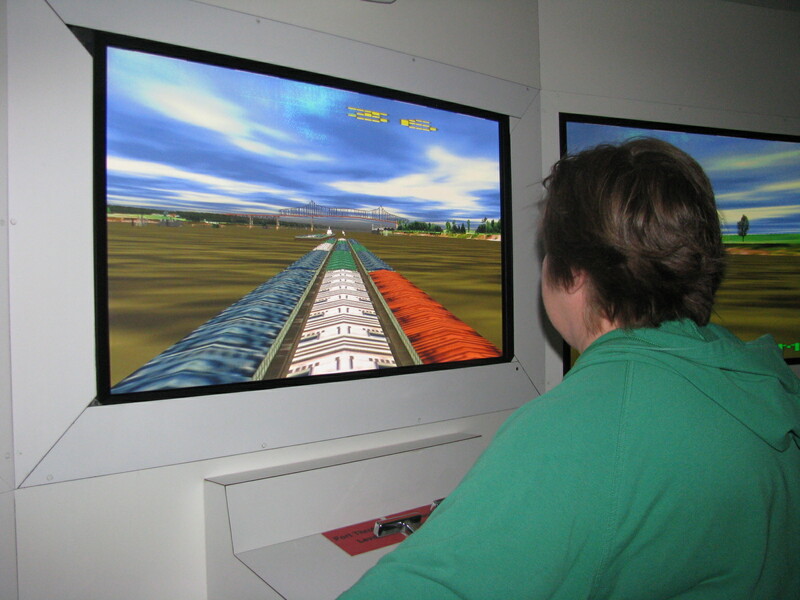 Here is Kim piloting a barge down the Mississippi River at the simulator at the Mississippi River Museum in Dubuque. She collided with another barge, but I ran a barge into a bridge! A big tank full of fish pulled from the Mississippi River is a neat, but somewhat neanderthal touch. The fish are all big and ugly and they have teeth. 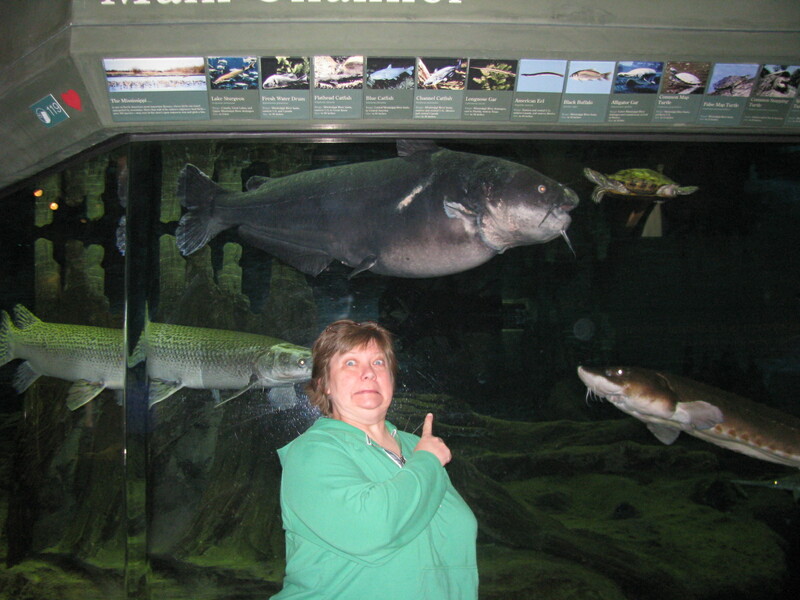 I caught Kim under this big catfish and yes, it is alive! We took a day off on Monday and went up to the National Mississippi River Museum in Dubuque. I will share some photos with you for the next few posts. Highly recommended for river buffs. 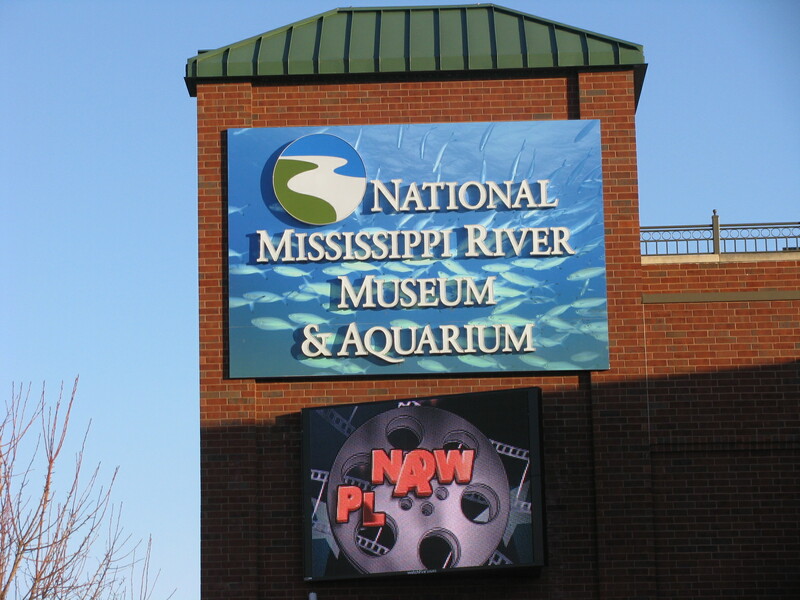 Did you know Mississippi means Big River in Ojibwa? This is not strictly pool14, but it is interesting. Excel, a Minnesota energy company, has positioned bird cams at several locations near their generating sites. They have several and you can view the laying and hatching of the eggs. Just down river from us in Pool 15, between LeClaire and Bettendorf, sits a huge Alcoa plant. Formally, it is in Riverdale Iowa, but it is called the Davenport plant. It is adjacent to the River. The good folks there spotted a bald eage pair nesting on a remote part of their property, and they just installed an eagle cam. It is not quite up to doing live feeds, but it will be soon. Right now they are posting stored videos and still shots. Definitely worth a look. I enjoyed it and there are parts on the Eagles in the Upper Mississippi River Valley.